On August 29, 2017, U2 announced that “You’re The Best Thing About Me” would be released as the first single from Songs of Experience. They also announced at the same time, that “The Blackout“ would be released as a streaming only video prior to the release of the single. “You’re The Best Thing About Me” was released on September 6, 2017, on digital platforms for sale, and to stream. On September 15, 2017 a remix of the song by Kygo titled “You’re The Best Thing About Me (U2 Vs. Kygo)” was released, credited to U2 and Kygo. On September 22, 2017, Kygo also released the remix on his “Stargazing“ EP. On September 29, 2017, another version of the song was released, this time an acoustic version mixed by Jacknife Lee. The single has been promoted with four videos to date. On September 6, 2017 a lyric video for “You’re The Best Thing About Me” was released on the U2Vevo account, and available for purchase in some online stores. This lyric video featured a book of lyrics and art, and we flip through the pages of the book as the video progresses. The lyric video was produced by Jos Diaz Contreras and Santiago Carrasquilla. On September 16th, 2017, a live performance video of Kygo spinning his remix of “You’re The Best Thing About Me” was released to promote the remix on the KygoMusic account on YouTube. The live performance video also features interviews with Kygo, Bono and the Edge about working together and the video was directed by Johannes Lovund. A third video, shot in New York, featuring the band having fun in the big apple filmed by Jonas Åkerlund was released on September 27, 2017 to promote the song. A fourth video was made available on October 5, 2017, on U2’s Vevo channel. This video was by producer Tatia Pilieva, and showed four couples in the midst of a separation, due to various circumstances. The video was removed on October 6th, but was quickly reuploaded. The video content was the same but the final credits on the video had changed. A fifth video filmed in Amsterdam, has not been released at this time. The song was released on September 6, 2017, but a mistake at the streaming service Tidal, announced in error that the song would be available on that platform on September 1, 2017. Images of the artwork for the single were included in promotional images on the Tidal site and in a new release video. Tidal later removed all references to the song, and the song did not appear until the proper release date. At this time all copies of the song have been released digitally, and there has not been a commercial physical single. The song has also been served to radio in digital format, including the original mix of the song, and a second remix by Jacknife Lee titled the Sci-Fi Soul Remix, which has not been commercially released. “You’re The Best Thing About Me” first was heard in a series of beach clips, captured by a fan listening to Bono play the song loud at his house in the South of France in August 2016. The clips were recorded from the public beach below Bono’s house. These were uploaded to the internet, setting off a wave of shut downs of fan sites including the popular Facebook group U2ITNOL2UU2. A few days later at the Cloud 9 music festival in Norway, on August 20, 2016, Norwegian DJ Kygo debuted his remix of the U2 track to the festival crowd. The song was accompanied by a lyric video, which showed city scenes, as the lyrics appeared on screen. In August 2016, the decision to delay Songs of Experience was also made, thus this performance may have been part of the initial build up to that release. Kygo was also booked to play the Hollywood Bowl on October 14 and 15, 2017, and Bono was rumoured to have plans to perform the song live with Kygo at one of those shows, but the move of the album release date caused those plans to be cancelled. The mix that was played in 2016 is not the mix that has been released, and the 2016 version included additional lyrics. The main version of “You’re The Best Thing About Me” single is not the original Kygo remix of the song heard in August 2016, nor is it the version that Steve Lillywhite had produced in August 2016. On August 31, a post on social media shared that the release would be a new mix of the song, from a new recording of the song that the band had done recently. The mix was done just a few days prior to the post on social media. The posthad shared that the new recording of the song by U2 had been sent to Steve Lillywhite as well as to an engineer in London for them both to mix the final track. In the end it was Lillywhite’s version that had been chosen, this featured as the single. I suppose I met him in Lillie’s one night, we were having a drink. I said to him that Alison, his wife, or Ali, was probably the best thing about him and the best tribute to him because she’s a fantastic woman. Really lovely person. They were childhood sweethearts. They went to Mount Temple together, the non-denominational school, and he was a big rock start, so she could have been a different type of person. But I think a lot of her social conscience and his social conscience and the things they’ve done — the good things — comes from Alison, or Ali, and that’s what I said to him. We were just out having a drink. It was really nothing serious but he remembered it – it must have been 10 or 15 years ago. She’s a wonderful girl. So that’s all I said. I was actually in France when he said it. Filming centered around a young woman wearing the lyric “The Best Things Are Easy to Destroy” on the back of her jacket. She was filmed in the park next to Amsterdam ArenA spray painting the same lyric on the sidewalk in a variety of locations. She was also filmed at other external locations, as well as entering the venue. Once inside there are reports of additional filming taking place on the first night including the girl and a young guy holding up signs on the GA floor. There was also footage done in the stands. The girl in the footage later was chosen to be the guest on stage for “Mysterious Ways” and her sign that she held up in the audience was “I can see what you can’t see”. She was carried bridal style to the front of the barrier by security at the start of “Mysterious Ways” and those fans at the rail were warned that this would happen prior to the show. Once on stage she danced frenetically to the song and was having a lot of fun, and Bono watched her throughout. After the song she was escorted off the stage and did not return to the crowd. The video from Amsterdam has yet to premiere, and the band shot a second video for the song in September 2017 in New York which has been released. The cover of the main single and the acoustic single features the daughter of The Edge and Morleigh Steinberg, Sian. Sian is wearing an army helmet which refers back to the images used for early artwork where Peter Rowen wore a similar helmet. 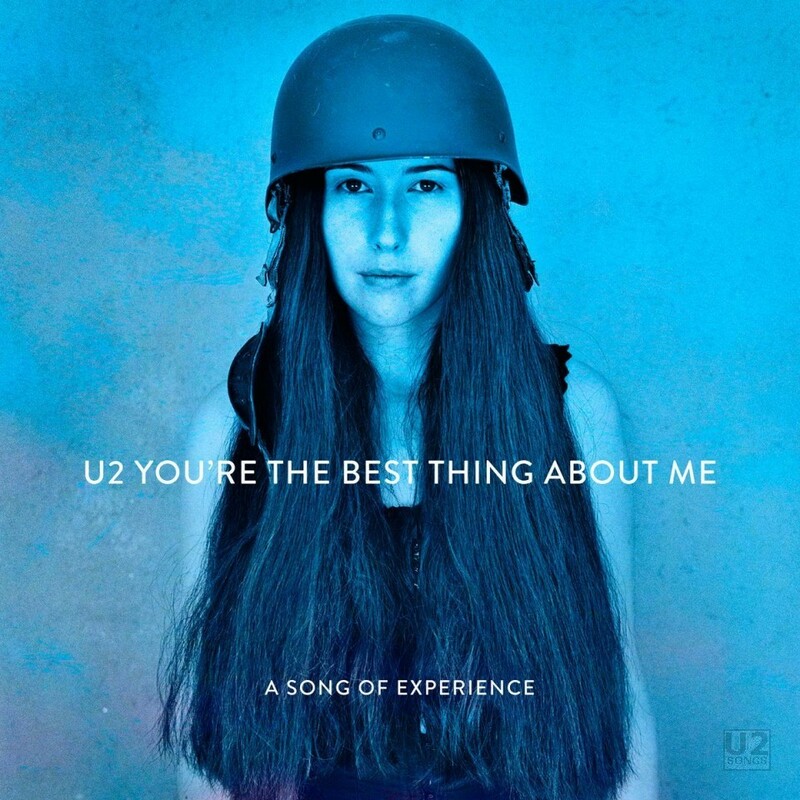 The image with Rowen is probably most famously used for The Best of 1980 – 1990 which contained another ode to Bono’s wife Ali, “The Sweetest Thing.” The cover for “You’re The Best Thing About Me” is tinted blue and features Sian staring toward the cover. U2 has been using another black and white image from the same photoshoot, this time with Bono’s son Eli holding Sian’s hand, at the end of the night when they play another “Song of Experience”, “The Little Things that Give You Away”. That image has been suggested to be the cover of the forthcoming album, Songs of Experience. Performed by U2 & Kygo. Produced by Kygo, Jacknife Lee. Remixed by Kygo and Miles Walker. Assistant Mixer: Ryan Jumper. Assistant Recording Engineer: Dave “Squirrel” Covell. Mastering Engineer: Scott Sedillo, Matt Bishop. Additional keyboard and programming: Jacknife Lee. Performed by U2. Produced by Jacknife Lee. Mixed by Jacknife Lee. Assistant Mixer: Matt Bishop. Engineered by Duncan Stewart. Mastered by Scott Sedillo. Additional drums and guitar: Jacknife Lee. Artwork done by Ampvisual. Photograph by Anton Corbijn.